The Ardara Walking Festival takes place annually on St. Patrick’s weekend. It features stunning coastal and mountain walks accompanied by our experienced guides. Click here to visit our Walking Festival page for details. The Nesbitts, from Dirleton in the Shire of Berwick, were first granted land on 20th December 1669. They were mainly responsible for Ardara’s development. The building was originally the old Courthouse. The Heritage Centre was officially opened by President Mary Robinson in 1993. Heading north up Front Street, you will cross the Owentocker bridge. 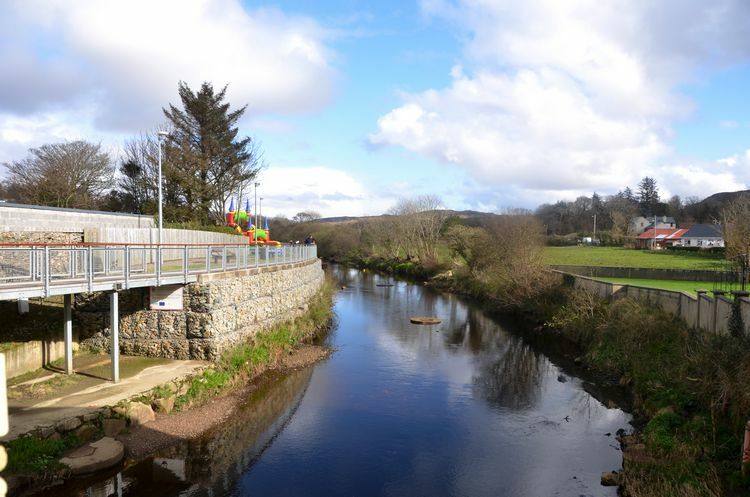 The river gets its name from the Irish “Abhainn tSocair”, meaning “gentle flowing, calm river”. There are many tweed and craft shops as well as pubs on both sides of the street. The sites of both churches were granted by members of the Nesbitt Family, and St. Connall’s Church cost £600 to build in 1833. Around St. Connell’s Church there are many gravestones, and the Nesbitt Family, who were landlords, are buried in the vault. One family called Evans, whose members emigrated to Birmingham, invented the hospital bed. “Our lady of Perpetual Succour”. Below the grotto there is a house on the left beside the Methodist Church car park. This was the home of Jimmy O’Rourke. Jimmy O’Rourke was a great story-teller and fiddle player. The central character in the film “Darby O’Gill and the Little People” was based on him. The film was researched in the 1940’s and in 1959 the world premiere was shown at the Mansion House in Dublin. The land on left was the site of an old church and, according to legend, Diarmuid and Grainne’s Bed. 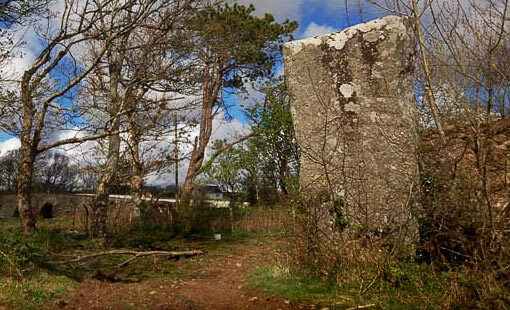 It also contained a burial ground, a dolmen and a stone circle – all gone now due to land reclamation. A Gaelic football pitch opened 13th June 1939. A quiet spot to relax and sit on the rocks or bathe when the tide is in. On the left behind the ruins is a large standing stone dating from the megalithic period. It is 3.6m (12ft) high and almost 2m wide, 4-sided and with two cup marks. Legend has it that Fionn mac Cumhaill threw this shoulder stone from Cró na Cléire Mountain. The stone may indeed have marked an ancient or modern boundary. Owenea means “Ring of the Wild Deer”. From the bridge, walk east along the riverbank. Ridges in the adjacent field indicate where potatoes were once grown, and the ruins of a house date to pre-famine times. The Owenea river is wonderful for salmon and trout fishing. Here you will find a picnic area with tables and seats as well as a little shed for shelter. Continue along the bog road, only used by turfcutters, anglers and walkers. You will walk for approximately 1.5 miles through blanket bog. Bogs are ancient, having their origins in a time when the country was covered with woods and a lush growth of plants and mosses. As the plants withered and died, layer upon layer of decaying material gradually formed bogland in waterlogged areas. For centuries, turf (or peat) has been harvested by people in bogland districts. The upper layers of some bogs have a light, mossy growth from which moss peat is made. After harvesting, it is graded and packed in a factory. Irish moss peat is used widely throughout the world for improving the condition of soil in gardens and for growing seeds and cuttings. Some of the disused bog has been planted with trees, some ploughed and reclaimed for grass growing, and experiments continue as to its use for vegetable growing. From here there are views of Loughros More Bay, Tullymore and the Fort. 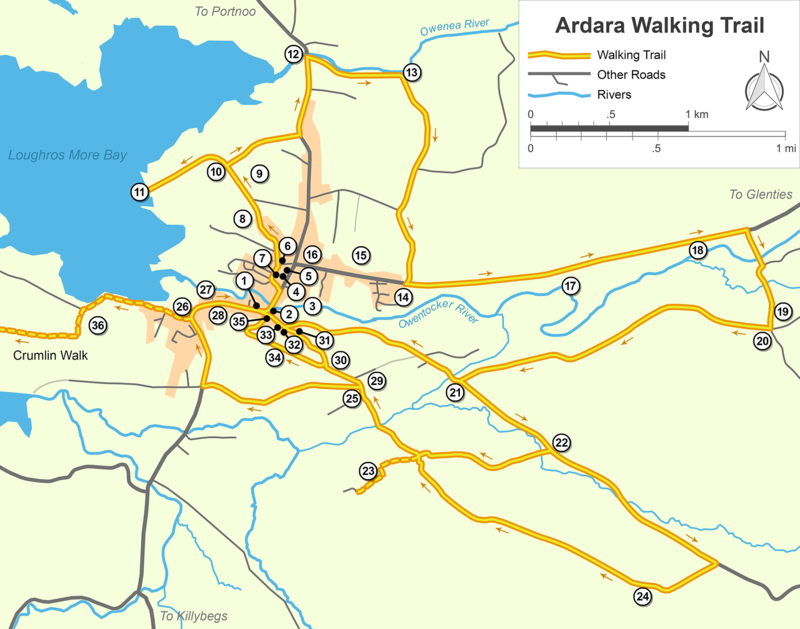 Turn right towards the Fort and Ardara, or turn left towards the Court Tomb for a longer walk. This is the Fort from which the town gets its name. The fort is the remains of an early Christian settlement and dates to around 500 AD. It may also have been used to shelter livestock. The area around the Community Centre is known as the “Cow Market”. It was really a horse market on Fair Days. It is now the Community Centre and a picnic area. About 1 mile along the Glenties road are the bare remains of a court tomb at Doohill (“Dark Wood” in irish). Where the river forks on the other side is a large mound on a hill, an old burial ground used for unbaptised children and for Catholics to be secretly buried during the persecutions (during penal times, Catholics were not allowed to practice their religion in public). The lime kiln on the left was used by farmers and tenants of a former era to burn limestones, which were then used on land as fertiliser. Lime was also used to make whitewash for thatched cottages and a little ‘blue’ was added to enhance the whiteness. 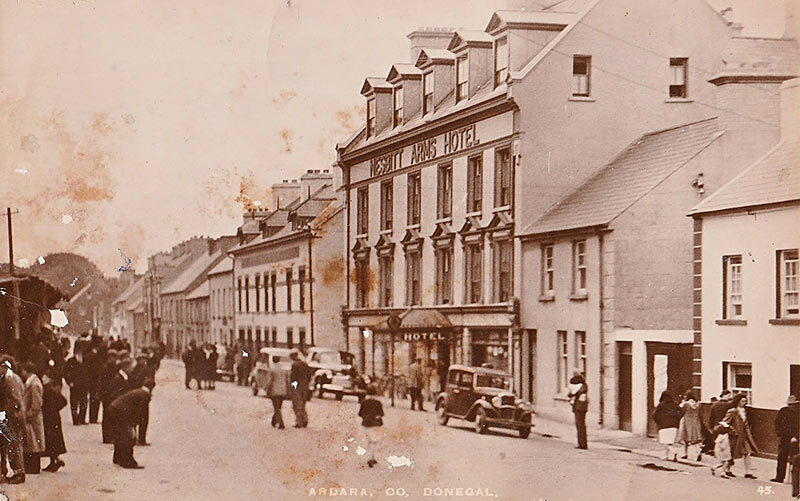 Turn right again and walk about 1 mile onto main Ardara–Donegal Road at Lurganboy. Along this road in the Nesbitts’ time the land was completely covered in woodland. Turn right to Ardara or left to continue on the trail. Turn right for shorter trail towards Kiltiernan Graveyard. Continue straight ahead for longer trail. There are spectacular views on this road overlooking Loughros Bay and Maghera. An old authentic thatched cottage here is still lived in. Ardvalley Hill 325 feet in height. Worth a walk, and with beautiful scenery, this is an ancient graveyard from pre-famine times and also the site of an early church, and a holy well. After the plantations and subsequent suppression of Catholicism people generally congregated here. Turn left towards the main Ardara-Killybegs road or continue straight ahead towards Woodhill. In olden times all this area was wooded. It was gradually turned into green pasture and used for growing grain and hay. The area is quiet, green, very scenic. The tighes for this area were much higher than the rest of the Ardara district. A ‘tigh’ was 10% of a tenant’s income paid to the landlord and/or Protestant Church in early decades of 19 century. There was a malicious burning of the sacristy of the church in 1907 because of a dispute between people and landed gentry over land and fishing rights. The ordinary person could not fish or shoot without paid permission from the landlord. This he could not afford. For this reason many people died during the famine even though they lived beside the sea. 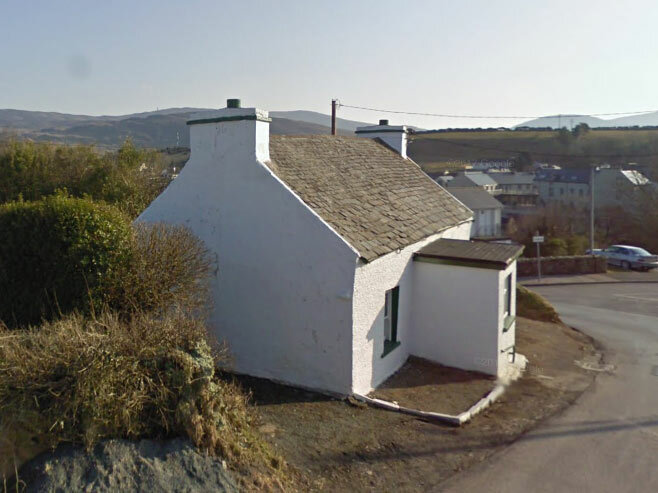 Before entering the town, the house at the corner of the Loughros Point and Ardara road was the site of the 4th school in Ardara. This was the only Catholic school. Behind Triona Design was an ancient Abbey. Monks were massacred here en masse. There was a standing stone here too. This has been removed in the last 20 years. One of the most noted buildings. 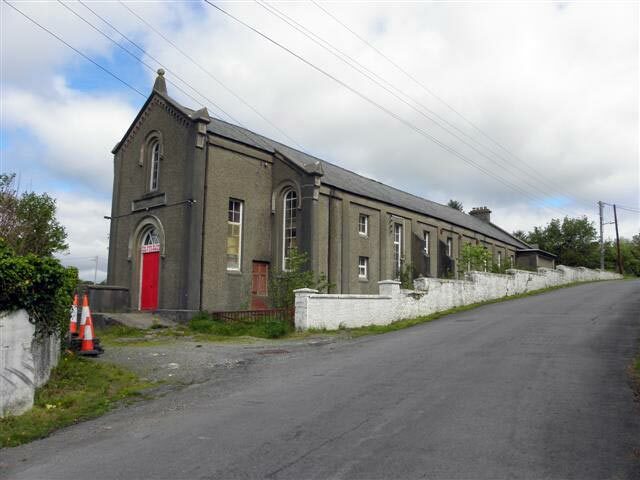 Built in 1903, it was the third church to be built in Ardara. John – eagle – evangelists (in between infant Christ in centre). The window was commissioned by Patrick Sweeney (Beagh) – in America. Supervised by his son James, then director of the Guggenheim Museum, New York. James’ brother Jack was curator of the Poetry Room in Lamont Library, Harvard University. Now a restaurant and guesthouse, this was originally the Nesbitts’ home. During the famine it was a soup kitchen. Rev. 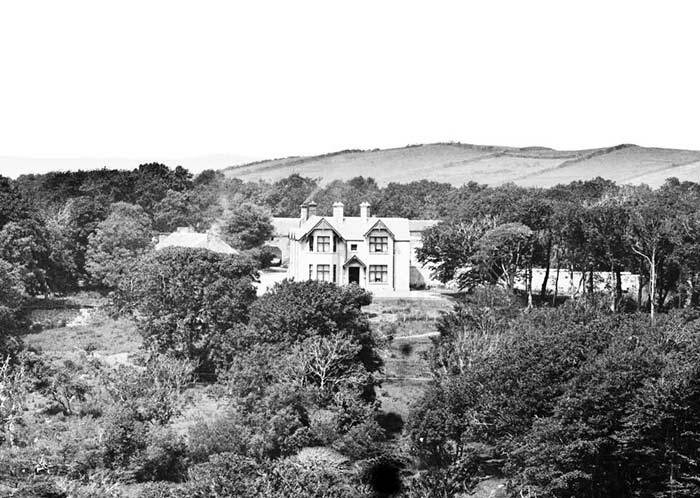 George Nesbitt built Wood House, a girls’ national school. General Tredennick inherited Woodhill in 1848. He died in 1880 and the house became uninhabited. The Congested Districts Board bought Woodhill in the 20th century. This was the end of an era. Site of the former ice house for the Nesbitts. There were two wells on this land which provided water for the town before the town water supply was installed. The shed on the left was originally the gate lodge to the demesne. Originally the site of a Boys’ National School. This is a breathtaking walk – overlooking the town and the valley to your left. This was the site of the first Catholic Church. The second church was built in the graveyard area of the present church. A short walk with amazing scenery. Past the Catholic Church on the Killybegs road, turn right towards Loughros Point. The area immediately to your right is called the Yellow Banks. Crumlin, meaning “curved glen”, is to the left. Legend says there was a wooden structure here – the summer residence of the Fianna when they were hunting in the area. Take the first left. As you walk along this ascending path many houses are dotted along the valley to the left. At the end you will see across the bay to Assaranca waterfall and Maghera with its beach and caves. At low tide you can walk towards Ballyganny beach, have a swim or pick cockles. From Crumlin you can also view Inisfallen Island, just off Ballyganny. Rocks here have the bare remains of a Cattle on them. A socketed bronze axe-head was found here in 1939. William Keogh in his 1984 publication “The Friendly Towns of Ireland” states that to him Ardara is Donegal. Specialist observers who have studied the unique landscape of Donegal show that Ardara is a microcosm of the entire county as it is located near a number of geological faults. The area attracts scientists because it affords variety in a compact area which would not be encountered without extensive travel over large expanses of land in most other parts of the world in terms of its geological formation. This, coupled with a fortuitous location at the junction of land and sea, and climatically influenced by both, as well as by tropical and arctic conditions, has contributed to the development of soils, flora and fauna, which are as rich and diverse as the scenery. All of these natural attributes remain largely intact, being aloof from industrial development and yet having associations with the events of history. The famine, which signified the failure of a particular agricultural system, is commemorated on the landscape by hand-made ridges – potato plots which have not since been cultivated. The advent of science in agriculture is seen in the remains of lime kilns, while evidence of early industrial development remains in old quarries and mines. Forestry, a modern land use, is also evident.